This notice outlined five MOV stem lubrication events at nuclear plants that pointed to issues with the grease lubrication of these interfaces. Presentation of this information at the MOV User’s Group meeting in 2011 noted that stem lubricant degradation can affect the efficiency of actuator torque conversion. The NRC again raised the issue at the MOV User’s Group in January, 2013 when they referred to an LER at Comanche Peak that cited an April 2011 failed surveillance on a PORV block valve, where the failure was found to be due to inadequate lubrication of the stem and stem nut over a 10 year period due to inaccessibility. To date, the only practical way of relubricating the stem and stem nut of an MOV requires stroking the valve back and forth or diassembly. There is now a more efficient option offered by MRG Labs called the StemThiefTM. After significant design and testing, MRG Labs introduced the StemThief at the 2013 MOV User’s Group meeting. A simple and straightforward design, the patent-pending StemThief uses the stem protector mounting threads in the actuator housing to introduce a device that creates a seal against the stem nut. This allows new fresh grease to be pumped into the stem/stem-nut thread area, purging out the old grease and particulates, establishing a new lubricant film for the threads. The relubricator tube section of the StemThief is sized to slide over the stem without impacting it, and a Zerk fitting mounted on the tube allows the new grease to be introduced with a manual lever grease gun. This device has been tested in an SMB-0 Limitorque actuator, with a G2 fit for the stem threads. Additionally, a “worst-case scenario” was simulated by placing the assembled stem and stem nut, with a generous coating of MOV Long Life NLGI 1, into an oven at 215 deg Celsius (420 deg F) for 14 hours to dry out the grease, and create a degraded grease and varnish layer on the surfaces. 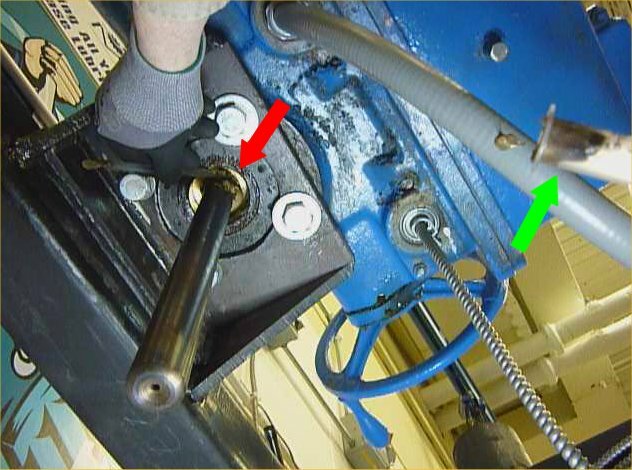 Even after this degradation, when the stem was allowed to cool to room temperature and reinstalled in the test stand actuator, the StemThief successfully displaced most of the old grease, and established a new grease coating on the threads. lubricant performance in MOV applications” can be systematically and objectively achieved.